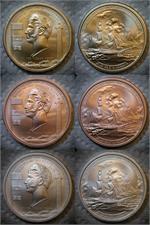 Set of three 1813-2013 Battle of Lake Erie & Perry Victory Bicentennial medals, satin finish, brass, copper, and silver. Britannia Stonehenge Fantasy Pattern. Not government-issue legal tender. Test-Pattern Stonehenge Fantasy Concept. Not government-issue legal tender.